Though it is priced at just $199, the Weslo Momentum CT3.0 elliptical has too many negatives to outweigh any savings you may get by buying this cheap crosstrainer. The LCD display window shows speed, time, distance, pulse and calories burned. It has two programs, an RPM meter, and a Target Pacer indicator light to alert you if you should pedal harder or softer to stay in a training zone. The Weslo Momentum CT3.0 elliptical has a manually adjustable magnetic resistance brake system that doesn’t mean a thing since you can crank the resistance to the max but it doesn’t make the workout harder. The resistance component doesn’t work on low-end machines. The 12" stride length is far too short for most adults to be comfortable. Also, these Weslo machines must be taken apart and greased regularly or the squeak will increase to a loud crescendo. Seriously, some elliptical reviewers have complained that they can’t hear the TV three feet away when pedaling on a Weslo. 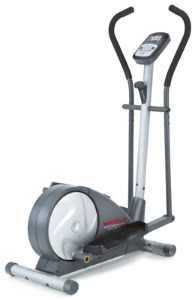 Elliptical reviewers, including professional equipment people and consumers alike, seem to agree that you don’t get much for your money with a cheap machine like this. The Weslo Momentum CT3.0 has a limited 90-day warranty on the parts for a reason. Many of the components such as pedals, flywheels, arms, and the like, are cheaply made but Weslo charges a lot for replacement parts — some parts cost $100 or more. It doesn’t make sense to spend money to repair it when something else will likely go wrong with it soon anyway. One other point: It seems redundant to have both an RPM meter and the Target Pacer light together on the display since they both function to let you know when to pick up the pace and when to slow down. And since the electronics on cheap low-end machines are notoriously unreliable, it won’t do you much good to have either feature on the console. The $199 Weslo Momentum CT3.0 isn't the best elliptical in the world and if you are looking for high quality, this isn't the one. That said, it is nearly impossible to recommend any decent cardio machine that sells for under $200 that’s worth a darn. They aren’t stable, they have cheap parts, and tend to make a lot of noise. But if you are looking for something super basic that you can lightly train on, it ain't the worst thing in the world.